Do locusts browse computer dating sites, trying to find a match made in heaven? Just check out the Bohart Museum of Entomology's newly published calendar. "Mr. January" is a locust sitting quite comfortably in a chair--a swivel chair at that--and eagerly accessing a dating site. "You've got a match!" the screen informs him. Yippee! You can almost hear him yelling "Yippee." The caption reads: "Normally, locusts are introverted creatures; they do not socialize unless it is for reproduction." 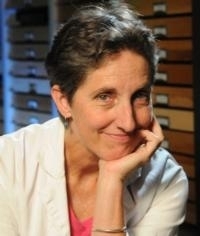 The rest of the story: Lynn Kimsey, director of the Bohart Museum of Entomology and longtime professor of entomology at the University of California, Davis, collects unusual answers on the student tests she administers. You can imagine how many sentences comprise her collection: she joined the faculty back in 1989! The "dating locust" is one of 12 from the Lynn Kimsey Prized Collection that made it into the Bohart's first-ever calendar. 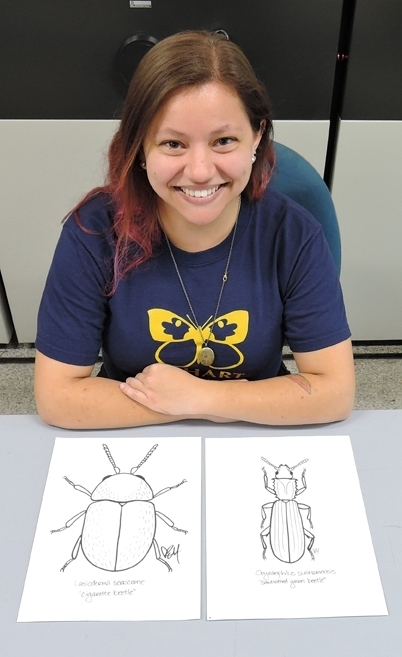 UC Davis entomology major Karissa Merritt, a talented artist and scientist known for her creativity and sense of humor, interpreted and illustrated all the sentences. It's an innovative and fun calendar, and yes, it's available to the public. The calendar, a project of the non-profit Bohart Museum Society, sells for $12, plus tax, at the Bohart Museum, located in Room 1124 of the Academic Surge Building on Crocker Lane. (More information is available on the website or by contacting bmuseum@ucdavis.edu or (530) 753-0493.) 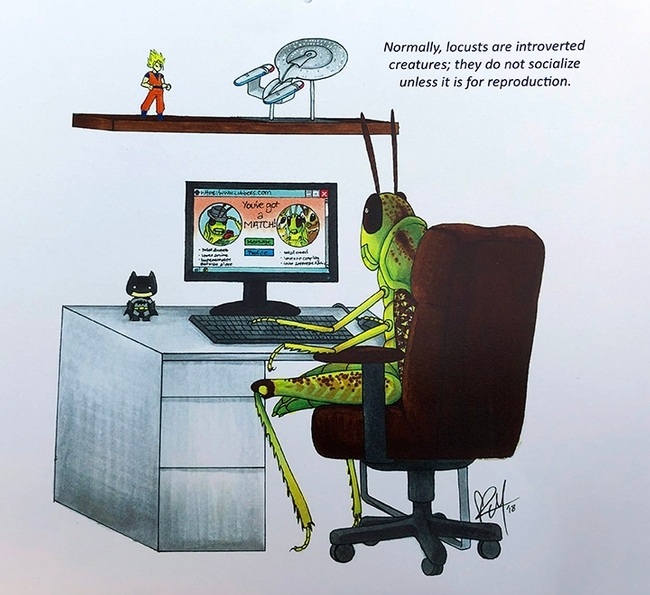 It's also available in the UC Davis Department of Entomology and Nematology administration office in 367 Briggs Hall. Those who contribute $50 or more to the Bohart Museum Society will receive a calendar with their donation. All proceeds are earmarked for research, education and outreach projects. Merritt says insects fascinate her. She's amazed at how "alien their biology and morphology are as compared to vertebrates." She's also drawn to their beauty and diversity. Professor Kimsey, who holds a doctorate in entomology from UC Davis, directs the world-renowned Bohart Museum, home of eight million specimens, a year-around gift shop and a live "petting zoo" which includes Madagascar hissing cockroaches, walking sticks and tarantulas. She specializes in bees, wasps and insect diversity. And collecting sentences--many apparently from sleep- or caffeine-deprived students. 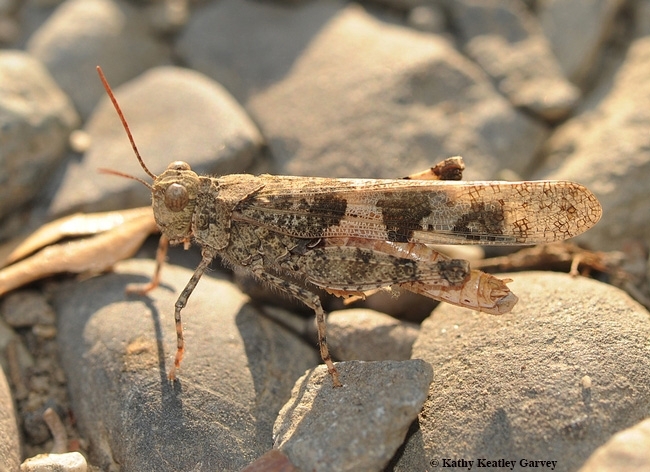 "Normally, locusts are introverted creatures; they do not socialize unless it is for reproduction."